Handle is a research robot standing 6.5 ft tall, travels at 9 mph and jumps 4 feet vertically. It uses electric power to operate both electric and hydraulic actuators, with a range of about 15 miles on one battery charge. 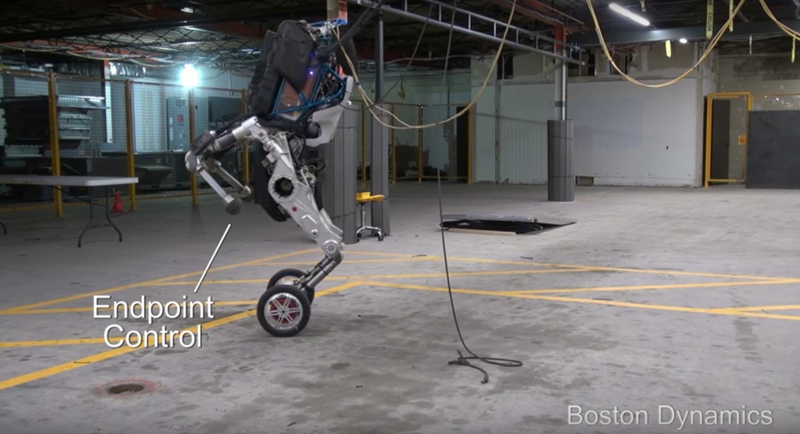 Handle uses many of the same dynamics, balance and mobile manipulation principles found in the other quadruped and biped robots Boston Dynamics’ build, but with only about 10 actuated joints, it is significantly less complex. Wheels are efficient on flat surfaces while legs can go almost anywhere: by combining wheels and legs Handle can have the best of both worlds. Two wonderful moments: tackling stairs like it’s no one’s business and the appropriate jumping freeze frame at the end.